The sixth edition of Professional Meeting Management is the newest edition of the longtime standard reference and textbook for the meetings industry and meetings education. 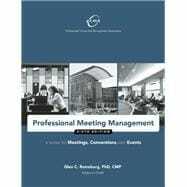 This is the first student and meeting professionals textbook aligned with the new Certified Meeting Professional (CMP) International Standards, which will be used by the Convention Industry Council as a reference book for item writing for the CMP Certification Examination. It includes the most up-to-date information on current trends, strategic planning for meetings, budgeting and funding, marketing and promotion, technology, running and closing the meeting, and industry developments on the horizon. Professional Convention Management Association (PCMA) represents more than 6,000 meeting industry leaders throughout the globe. With 17 chapters in the United States, Canada and Mexico, its members include planner and trade show/exhibit professionals, suppliers, faculty, and students.